We’re still waiting to find out if the iPhone 8 will boast a fingerprint scanner under its display, but even if it doesn’t you will see several handsets employ the tech in 2018. TechRadar sat down with Raj Talluri, SVP and GM of Qualcomm’s IoT business, at IFA 2017 to discuss the future of the biometric tech, and he confirmed that the technology will be ready to launch next year. Qualcomm announced its own ultrasonic Snapdragon Sense ID 3D Fingerprint Technology that can work through metal and glass back in 2015, but it’s only now it’s nearing inclusion under smartphone displays. Earlier this year, the tech was seen by Engadget in action on a prototype Vivo device at MWC Shanghai, but we're still waiting for the first consumer handset to go on sale. Talluri explained that getting a viable under-screen fingerprint scanner hasn’t been straight forward. During the development phase, as Qualcomm moved the technology from concept to production, it found parameters kept changing on the material it needed to work through. “Just when you think you’ve got it figured under plastic, phones became glass, just when you got it figured under glass the focus became the display,” Talluri told us. Now Qualcomm is at a stage where it’s got it all working. 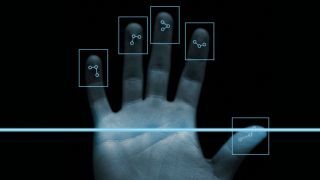 That means phones such as the Samsung Galaxy S9, LG G7 and HTC U12 could all feature under screen fingerprint scanners - which would be a welcome relocation from some of the more poorly placed rear digit readers (Samsung, we’re look at you). But will Apple get there first on September 12, when it takes the covers off its latest fleet of iPhones? We'll have to wait and see.